Nobody rocks Pedal Power like Rock The Bike. We love getting involved with high schools and universities in the Bay Area. Working directly with kids is such an awesome way to make an impact on our future. – Bringing a Pedal Power demonstration to a school, such as a bike blender, the ice cream bike, or pedal powered spin art. This can happen on its own or in conjunction with a schoolwide event such as Earth Day. – Pedal powering a school assembly on Pedal Power Science. 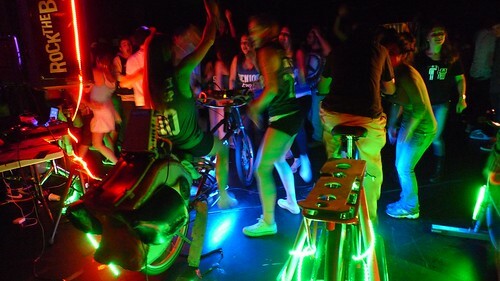 – Pedal Powering a school dance or host a performance. Above: Students K-12 attend a Pedal Power Assembly with Rock the Bike and Shake Your Peace! When we get to a school, we try to connect with students as soon as we roll up (often on our cargo bikes.) Our funky bikes and impressive load-hauling skills are a great way to break the ice with students. We try to get kids involved, even if it’s just holding a door open. 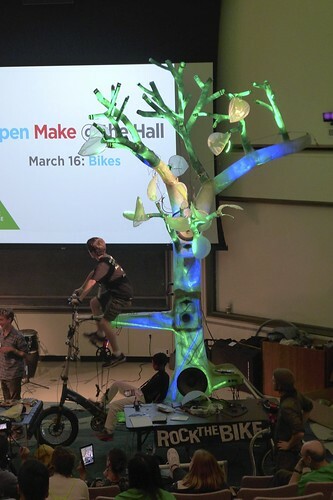 As we move our bikes through the hallways to the auditorium or classroom where we’re working, we answer questions about bikes and play a couple good songs (at moderate levels). This is our chance to get out of our workshop and meet some young people in the community, so we enjoy the challenge of breaking through to individual students, even those we pass in the hallway. 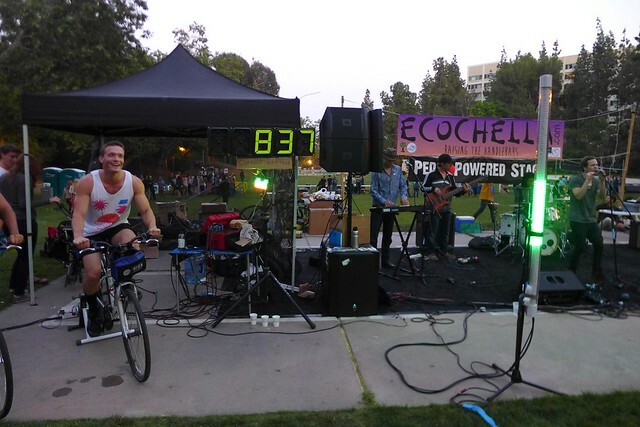 Above: Students at UCLA Pedal Powered the sound system for Ecochella. Here are some of the schools we’ve worked with. Above: Students from The Urban School at a winter dance pedal powered by Rock The Bike. 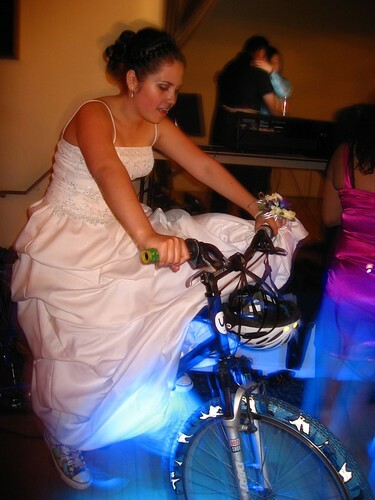 Above: Mission High School student pedal powering their Green Prom. 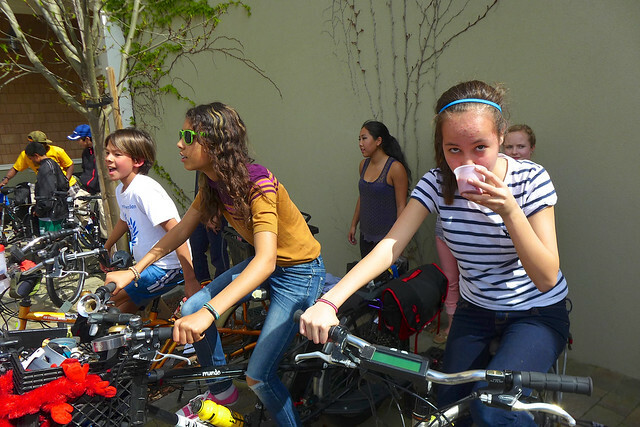 Above: Students take turns Pedal Powering an assembly at Head-Royce School. Above: Two high school students power loudspeakers and a subwoofer. Also, please note that most of our products are perfect for schools, most notably the Fender Blender Universale. To begin planning Rock the Bike at your school, please answer these questions and email us your responses. 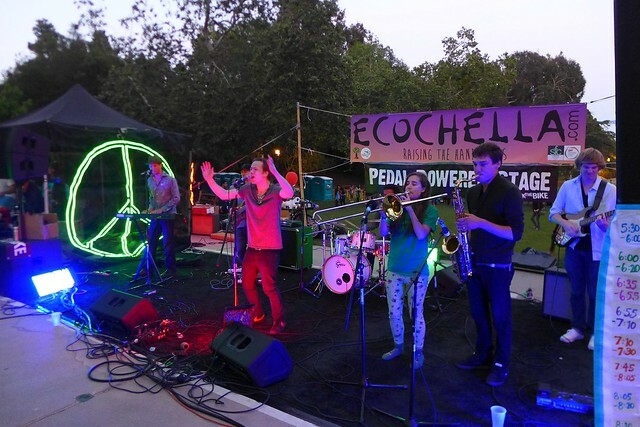 Also, check out more Pedal Powered Activities that you can rent for your event.